Like a cinematic version of Where’s Waldo?, classic movie fans delight in spotting the rotund Alfred Hitchcock in cameo appearances in over half of his films – a body of work spanning half a century. The Master of Suspense tipped his directorial cap to influential filmmakers D.W. Griffith and Charles Chaplin, both of whom stepped from behind the camera onto the silver screen. As Hitchcock became bigger in fame and physique, so his cameos grew from simple walk-ons to key moments of comic relief, pin pricks of humor during stretches of taut suspense or subtle introductions to impending madness. Even from behind, Hitchcock is unmistakable. He called The Lodger his first real film, and the silent thriller also marks his first cameo appearance where he’s a reporter toiling at his desk with his back facing the camera. Hitchcock aficionados insist the director appears again amidst an angry mob later in the film, but this sighting continues to be disputed (see photo above). Biographer Patrick McGilligan says the cinematic debut was “intended as a wink at the press, rather than an attempt to launch himself as a public figure.” Others claim the cameo was spontaneous, that the director was just stepping in to fill the scene when there weren’t enough extras on set. Either way, The Lodger was the first of many films to go off with a Hitch. Many things frightened Alfred Hitchcock: policemen, heights, eggs (yes, eggs! ), and small children. “The only way to get rid of my fears is to make films about them,” he said. Indeed, most of his tales are rife with policemen or detectives; heroes and villains alike dangle from extreme precipices. Even one of those dastardly eggs cracks open against a windowpane in To Catch a Thief. In Blackmail, the small children are at play. Poor Hitch is a quiet passenger who catches the mischievous eye of a spoiled brat who torments him and pulls his hat down over his ears. Hitchcock manages to make two terriers stand out during a movie about birds. He strolls past Tippi Hedren at “Davidson’s Pet Shop” with the pair of pups skittering daintily at the ends of their leashes. This scene was memorably revived in an episode of The Simpsons called “A Streetcar Named Marge” (1992). Hitchcock called Shadow of a Doubt – the tale of a murderous uncle who hides out in his idyllic hometown – his favorite among his own films. Just as Uncle Charlie is figuratively hiding all of his cards near the beginning of the film, Hitch is literally showing his. The director can easily be spotted on the train to Santa Rosa playing a game of cards with fellow passengers. Don’t forget to check out his hand; he’s palming a full suit of spades! By 1959, Hitchcock fans had playing the game of “Where’s Hitch?” for over 2 decades, but sometimes spotting the director meant missing out on the story. Hitchcock wanted his audience to focus on the intricate details of his plot rather than comb the background for his inevitable appearance. No one can miss him at the beginning of North By Northwest when he narrowly misses boarding a bus. Hitchcock does catch the bus in To Catch a Thief before a very striped Cary Grant arrives and wedges himself between Hitch and a cage of twittering birds. Grant’s sidelong glance at the stoic master offers a great comedic moment and kicks off the start of his unpredictable journey. Luckily for Grant, it was nearly a decade before The Birds would become a deadly menace. Time is running out faster than the flow of champagne at the Nazi soiree in Notorious. Ingrid Bergman and Cary Grant must slip away to investigate the wine cellar undetected. Unfortunately, Hitch is knocking back the booze like an overgrown frat boy, inadvertently closing a window of time for the heroes before the villain (Claude Raines) has to leave the party to replenish the bar. Hey, even Masters of Suspense have to unwind. Leave it to Hitch to befriend a murderer…or at least dine with one. 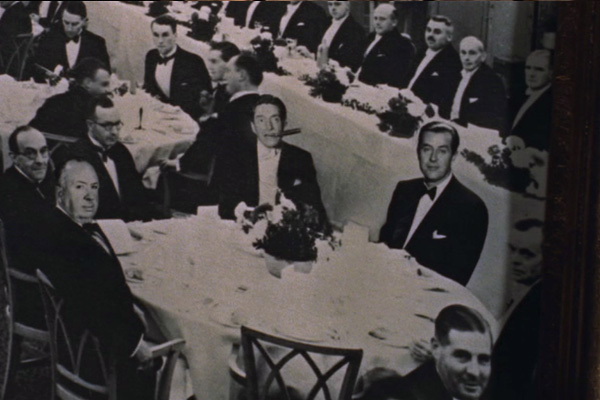 In one of his most comedic cameo appearances, the Master of Suspense sits at a Cambridge Alumni Reunion dinner, gazing out from a photograph. Tom Wendice (Ray Milland) and his future hired assassin sit across from their old school chum. Hitchcock literally winds up the suspense early in Rear Window. L.B. Jeffries (James Stewart) is spying on his neighbors across the courtyard when the director appears in the songwriter’s apartment. When Jeffries shifts his focus from the bickering Thorwalds to the piano-playing songwriter, Hitch is slowly winding a clock on the mantel, just as he’s slowly winding the suspense from behind the camera. Forget NutriSystem. Don’t bother calling Jenny. The “Reduco Obesity Slayer” is the latest fat reduction plan on the market. Well, it was in Lifeboat where Alfred Hitchcock modeled his less-than-girlish figure for the fictional ad in William Bendix’s newspaper. The Lifeboat cameo was Hitchcock’s most creative. The entire film takes place on the wind-tossed vessel, leaving little room for him to make his trademark appearance. He could float by as a bloated corpse or bob along the waves in an inflatable raft, but these over-the-top options would detract from the serious nature of the plot. How about 1948’s “Rope”, where Hitch had his famed self-caricature done in neon among the model skyscrapers and hawking “Reduco” from “Lifeboat”? (Although some claim Hitch walks across the street immediately after the titles’ end) And his speaking prologue to his 1957 “The Wrong Man”, where he tells the audience this picture will be based on a true story, the only time he spoke in any of his films. You forgot about “Psycho” at the beginning of the movie, he is standing with his back turned as Marion (Janet Leigh) walks into the bank office where she works.